Fats supply energy and essential fatty acids, and they help absorb the fat-soluble vitamins A, D, E, and K. You need some fat in the food you eat, but choose sensibly. Some kinds of fat especially saturated fats, increase the risk for coronary heart disease by raising the blood cholesterol. In contrast, unsaturated fats (found mainly in vegetable oils) do not increase blood cholesterol. Fat intake in the most parts of the world is lower than it was many years ago, but most people still eat too much-saturated fat. Eating lots of fat of any type can provide excess calories. Foods high in saturated fats tend to raise blood cholesterol. These foods include high-fat dairy products (like cheese, whole milk, cream, butter, and full-fat ice cream), fatty fresh and processed meats, the skin and fat of poultry, lard, palm oil, and coconut oil. Keep your intake of these foods low. Foods that are high in cholesterol also tend to raise blood cholesterol. These foods include liver and other organ meats, egg yolks, and dairy fats. Foods high in trans fatty acids tend to raise blood cholesterol. These foods include those high in partially hydrogenated vegetable oils, such as many hard kinds of margarine and shortenings. Foods with high amounts of these ingredients include some commercially fried foods and some bakery goods. All kinds of unsaturated fats (oils) help keep blood cholesterol low. Unsaturated fats occur in vegetable oils, most nuts, olives, avocados, and fatty fish like salmon. Unsaturated oils include both monounsaturated fats and polyunsaturated fats. Olive, canola, and peanut oils are some of the oils high in monounsaturated fats. Vegetable oils such as soybean oil, corn oil, and cottonseed oil and many kinds of nuts are good sources of polyunsaturated fats. Fatty ocean fish have a special type of polyunsaturated fat (omega-3 fatty acids) that may protect you against heart disease. Use moderate amounts of foods high in unsaturated fats, taking care to avoid excess calories. Get most of your calories from plant foods (grains, fruits, vegetables). If you eat foods high in saturated fat for a special occasion, return to foods that are low in saturated fat the next day. Choose vegetable oils rather than solid fats (meat and dairy fats, shortening). If you need fewer calories, decrease the amount of fat you use in cooking and at the table. Choose 2 to 3 servings of fish, shellfish, lean poultry, other lean meats, beans, or nuts daily. Trim fat from meat and take the skin off poultry—this removes about half the fat. Choose dried beans, peas, or lentils often. Limit your intake of high-fat processed meats such as sausages, salami, bologna, and other cold cuts. Try the lower fat varieties (check the Nutrition Facts Label). Limit your intake of liver and other organ meats. Use egg yolks and whole eggs in moderation. Use egg whites and egg substitutes freely when cooking since they contain no cholesterol. Choose fat-free or low-fat milk, fat-free or low-fat yogurt, and low-fat cheese most often. Try switching from whole to fat-free or low-fat milk. This decreases the saturated fat and calories but keeps all other nutrients the same. Check the Nutrition Facts Label to see how much-saturated fat and cholesterol are in a serving of prepared food. Choose foods lower in saturated fat and cholesterol. Try to order fish or lean meats as suggested above. Try to avoid or limit ground meat and fatty processed meats, marbled steaks, and cheese. Avoid foods with creamy sauces, and add little or no butter to your food. Choose fruit desserts most often. Following the tips above will help you keep your intake of saturated fat at less than 10 percent of calories and your cholesterol intake less than 300 mg/day. 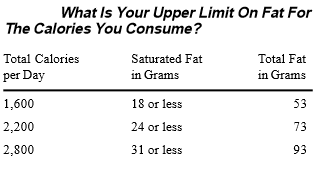 If you want more flexibility, see picture below to find out your saturated fat limit in grams. The maximum number of saturated fat grams depends on the amount of calories you get daily. Use Nutrition Facts Labels to find out how much-saturated fat is in prepared foods. If you choose one food that is high in saturated fat, make your other choices low in saturated fat. This will help you stay under your saturated fat limit for the day. Different forms of the same food may be very different in their content of saturated fat. The picture below provides some examples. 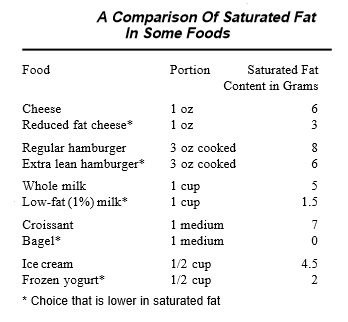 Try to choose the forms of food that are lower in saturated fat most often. Beginning at age 2, children should get most of their calories from grain products; fruits; vegetables; low-fat dairy products; and beans, lean meat and poultry, fish, or nuts. Limit use of animal fats, hard margarines (unless labeled trans fatty acid free), and partially hydrogenated shortenings. Use vegetable oils as a substitute. Choose fat-free or low-fat dairy products, cooked dried beans and peas, fish, and lean meats and poultry. Eat plenty of grain products, vegetables, and fruits daily. Use the Nutrition Facts Label to help you choose foods lower in fat, saturated fat, and cholesterol.